Especially designed with your cat’s comfort in mind, our peaceful, bright and climate-controlled cat boarding room is staffed with a veterinarian care team who are passionate and dedicated cat lovers. 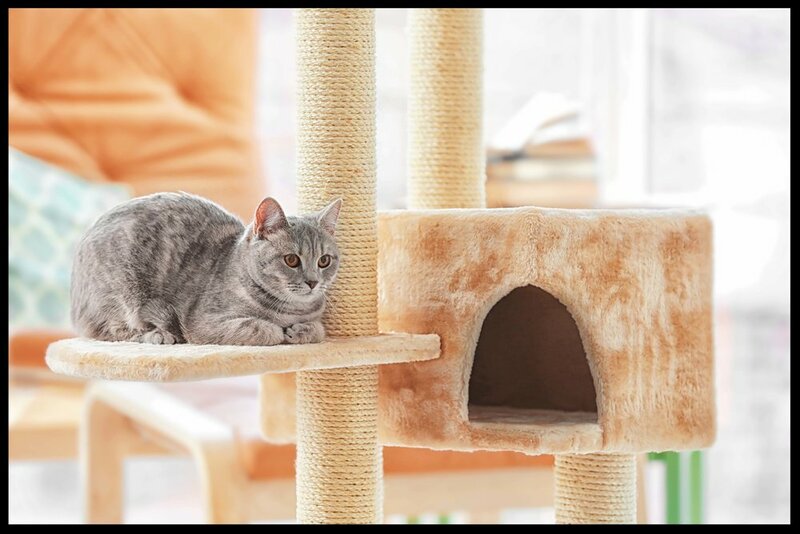 All cats are offered daily individual exercise periods and may choose to explore the boarding room, or simply curl up for a catnap on the cat tree. Each cat enjoys its own cozy, plush suite with a large window, complete with freshly laundered bedding daily – a true “home away from home” experience. Many clients whose cats have medical conditions board their beloved cats with us because of the level of monitoring we do. If a boarder is not eating, or not using the litter box with normal frequency, or if there are any other problems, our technicians will notify the doctor immediately. If you are interested in boarding your cat in our cozy, relaxing cat boarding room please fill out the form below to speed up your reservation! We accept new patients for boarding after they have received an examination with our veterinarian and we have reviewed their previous medical and vaccination history. Please complete as much as possible, if you are unsure of any details just leave them blank and we will discuss them with you. We will contact you to schedule an examination with Dr. Bonder to assess that your cat is a good candidate for boarding. We do not accept intact males (Non Neutered). All cats are required to have their annual exams within the last year and their FVRCP vaccine up to date. Yes, I consent to the Downtown Toronto Cat Clinic to obtain the most recent medical records from my current veterinarian. No, I will provide the up to date medical records for my pet and ensure the Downtown Toronto Cat Clinic receives them prior to boarding.